Lia Certification - Unlimited Unnati Pvt. Ltd. 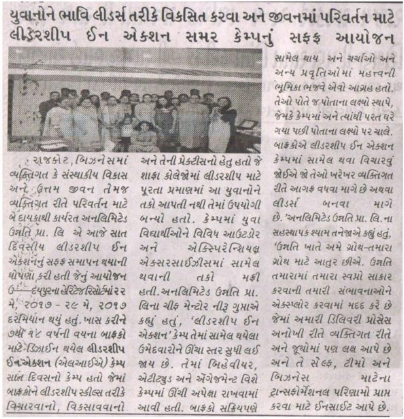 Leadership in Action Summer Camp was organized by Unnati Unlimited for youngsters from age 7-18 years. The 7 day camp was held at Heritage Resort, Udaipur. The camp established various outdoor experiential activities. The participants were asked to think, develop and implement Leadership Skills in their day to day life and work on their behavior attitude. The motto of the camp was to build up the youth into developed leaders. The seminar was held by Neeru Gupta.